Mark's Media Blogfest · Roger Ebert… Finding his voice in a new medium. 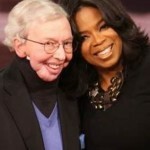 Roger Ebert… Finding his voice in a new medium. So as of late, I’ve been following my twitter account pretty seriously. I have about 30 or so people that I follow, including various celebrities and people that I know. One of the people that I have been following is Roger Ebert. I am a big film fan and I thought that his thoughts on current films would be interesting. As it turns out Roger tweets about everything; films, politics, pop culture, daily activities, everything. To be honest I was a little bit upset because my twitter wall was very much dominated by Ebert. He posts five or six posts at a time and does it several times a day. I was getting sick of Ebert. Then I watched Oprah today… Roger Ebert was the guest, and he was talking about his battle with cancer which has left him without a throat, jaw, and the ability to speak. I was blown away because I had no idea. Apparently this has been something he has been dealing with for a few years now, but I had not heard. Suddenly I was fascinated by the fact that he is on twitter so much. After losing the ability to speak, he has found a new way to communicate with the world, which is through is blogs and through twitter. I thought that this was such an interesting example of people using new technological media. Not only is Roger writing in blog form, but on Oprah’s show they showed clips of him working with computer programmers to create a program that allows him to type into his computer and in turn the computer will use the thousands of hours of Roger’s recorded voice from over the years, to convert the text into speech using Roger’s own voice. This experience has given me yet another perspective on the use of media in our culture today, and a new found respect/interest in all of Roger Ebert’s tweets that fill my wall every day. Mark – check out this amazing feature on Ebert.